In my last installment I talked about the combat & magic rules for Whitehack. If you're interested in an Actual Play example, check out this entry. (It uses some innovations from Scarlet Heroes because the module I played was for 4-10 characters but other than that it's purely Whitehack). In this blog post, I want to take a look at the first part of the Game Master section of the book. 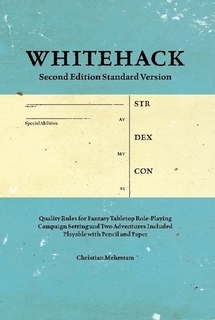 Whitehack is for those who like to balance Referee power and player freedom, but just as much for those who like to prepare stories, to get into the mind of their characters, to engage in strategic combat, to collect and paint miniatures and terrain, to hang out with their friends or to sit by and watch others do most of the playing! The game is supposed to bring people together, not set them apart. Christian Mehrstam states that the rules are there to make things more challenging and to provide structure and means of resolution instead of helping the Referee to run the game. The Referee is clearly more powerful than the players and the goal is to succeed in telling a story together by risking failure in following the rules. I find some of the notions particularly interesting. I like how the author points out that the rules are there to make the game more difficult instead of making it easier for the players. It's a good idea to communicate this concept to the players to get on the same page what old school role-playing means in regards to playing Whitehack. Here we find guidance on how to "hack your notion of normal", about switching or mixing genres, using real word history influences or using a literary setting. While the information is painted in broad strokes it's still interesting to read and gives you some good ideas. Furthermore, we find advice on RPG Story Phases as a tool for creating fantasy adventures. The author breaks down typical adventure structures into different phases. For example, there is the hook (which you can skip), then there is a preparation phase (investigation, gather equipment) and then a traveling phase (exploration). Afterward, you have the climactic confrontation and then probably an end phase where the players deal with the consequences of their doing. Sprinkle in some phases for resting, social encounters etc. He admits that other structures are possible (mystery adventures, urban adventures, dungeon crawls). For dungeons, there is a small section on how to create a rudimentary crawl. Again, very basic advice but useful nonetheless. Additionally, Christian Mehrstam uses visual connection maps (similar to mind maps) to illustrate NPC agendas etc. This is more or less something like Bankuei's Conflict Web. Then add events to bring things into motion. And use random tables. Lastly, we find some blurb about campaigns. I'm not to sure what to make out of it. I think it's just the author's point of view about what defines a campaign and how he plays campaigns/constructs campaigns out of adventures. This section covers how to use modules for other D&D games. As Whitehack has its own armor class system, you'll need to convert that. Some minor tweaking to Attack Value might be necessary. Also, there's advice on how to uses monsters, spells, and abilities. There is advice on reaction rolls, morale checks, hirelings, and retainers plus vehicle combat. For example, a reaction roll is a Charisma task. Vehicles are handled as characters with AC, ST, weaponry and special attacks. Retainers don't play a big role and are always HD 1 NPCs who can't level up. The book includes a table for crawling rates and traveling rates for wilderness adventures. Christian Mehrstam explains how these type of gameplay can be utilized in Whitehack. Moreover, he shines a light on using miniatures and terrain. Whitehack can be used with the standard grid map (1 inch = 5 ft.) but also offers alternatives. Next up is the compelling addition of a mechanic for Corruption. This is a catch-all for radiation, madness, influence of chaos etc. (the Dark Side!). It's split up in corruption levels (CL). The more levels you have, the more "corrupted" you are. You gain effects at higher levels, i.e. phobias, mutated skin, scars. Sometimes you need to make a Saving Throw to negate effects but failing makes things worse. In some cases a high CL can be positive because some creatures, places or objects can favor a high corruption. All in all, a very easy mechanic which adds a welcome twist to the rules. It was not part of the 1st edition. As already mentioned in my post about combat and magic the game also includes a toolkit for using traditional magic instead the freeform magic system. This is especially useful if you want to play modules for other D&D variants. The 1st edition of Whitehack contained the three base classes Deft, Wise and Strong. Here you can find more classes which you can make available to players after one of their "base" characters has died. The two new classes are the Brave and the Fortunate. They come with their own advancement tables, like the core classes. The rare classes play differently from the regular classes and produce characters that are uncommon in the game world. The Brave is the underdog and if he fails a roll he gains a "comeback die" (d6) which he can add at a later roll. You can use multiple comeback dice but only the highest counts. Furthermore, he can negate an attack or successful harmful miracle once per session. He has slots for special quirks (8 to choose from). For example, enemies always attack someone else first at the start of the battle. There are some more special rules that make the Brave unique. It's certainly something different from the standard classes and nothing which has obvious roots in D&D classes. The second rare class is the Fortunate, a lucky or rich character, someone with good fortune. There is an option to use influence once per session for a major boon (i.e. getting a personal audience with the queen). He also has a special standing that makes faction groups more willing to help him. The other defining characteristic is that the Fortunate can have retainers that advance in level. However, that means that the player character has to spend gold XP on his retainers. The class owns a signature item and can wear all weapons and armor. The author also addresses how to create a species-as-class character and gives two examples of the White Curse campaign setting: The Dagonite and the Marionette. Basically everything works as per normal rules found in the earlier chapters. You create a character with a species vocation and then come to an agreement with the Referee about how the species works, what their limitations or advantages are and how powerful these should be. The Referee is free to adjust the XP requirements for leveling up. There are some details about the two example species. The Dagonites are amphibian creatures and are technologically pretty advanced. They need to be Deft or Wise and need a vocation related to either crafting, summoning or rune carving. The Marionette is a puppet creature, created from the souls of dead humanoids. Marionettes wear an intricate face mask with a ghost box which allows them to speak to others. Like robots, they are immune to diseases and poison, don't need to drink or eat etc. You know the drill. They have magic restrictions (like the Asimov's Three Laws of Robotics). Interestingly, as they are undead creatures, they can be exorcised! They are restricted to the Strong and Deft class and have vocations like Butler, Medic, Slave or Adjutant. They need double XP to advance. Altogether a very appealing class that shows the evocative feel of the White Curse setting. Plus, it illustrates how easy it is to create a species for Whitehack. The maximum level is level 10. The author included two extra rules: Divine Aid & Debts and Playing With Aspects. The first option allows for a higher influence of the divine on your campaign. A character can dedicate an affiliation group to a higher power and is granted divine aid which allows him to do incredible things. It comes at the cost of the power also demanding more from him which can open up more quests. The second option allows players narrative control about aspects of the game world. This should be fun for those who also like collaborative world building as they are allowed to introduce new elements to the game (at the Referee's discretion). Compared to the first edition of Whitehack this part of the book contains much more information. Most of the general advice is given in broad strokes and gives a good overview. It can't (and wasn't supposed to) supplant a complete Game Master's guide. Although Whitehack is old school there are some newer ideas thrown in, for example, the mind maps. The idea of "hacking your notion of normal" is pretty neat because it can easily provide you with the skeleton of a setting. It's a fine starting point. Differently than the first edition, the game now includes conversion notes for traditional old school modules which are written for other retro-clones or original D&D iterations. This is very helpful. The section about traditional magic is also quite useful as the open-ended nature of selecting miracle wordings at the start of play can be intimidating for players. This tool provides a valuable option to use "standard spells" and is also good if you run traditional modules where those are used. The new rare classes are a nice addition, but I'm glad that they are restricted. I don't think that they should replace the standard classes. The corruption mechanic opens up some mechanical possibilities and is a very cool addition. For example, you could use this for corrupting magic users (sword & sorcery?) or if you want more sci-fi for simulating radiation. All things considered, this portion of the book is an interesting read. Some of the material can be used universally (i.e. the Story Phases or the setting part) which is also a plus.